Exablaze's ExaNIC GM is a combined Precision Time Protocol (PTP) Grandmaster and ultra low latency network card. The device is conveniently packaged in a PCIe card form factor with twin SFP+ ports, making it easy to install, and saving valuable rack units. An onboard GNSS receiver (GPS & GLONASS) enables the GM to tightly synchronize its onboard oscillator to UTC time from anywhere on the globe. During times when the GPS signal is lost (known as holdover), the GM will revert to using this onboard oscillator as a time reference for the PTP network. A high quality oven controlled oscillator (OCXO) is typically fitted, resulting in excellent holdover performance of better than 15us drift over 24 hours. For applications requiring even better holdover performance a chip scale atomic clock (CSAC) is available instead of the OCXO. The FPGA on the GM includes a microprocessor which completely handles all PTP communication with PTP Slaves on the network. Whilst the host PC can be used to manage configuration and obtain status information from the GM, it is not required to serve PTP to the network - which means if the host operating systems fails to boot or suffers a critical failure there will be no impact to timing on the network. The host clock can be synchronized to the GM using the provided drivers. An additional PPS connector can be used as either an input or output. When operating in output mode a 10MHz or 1PPS signal can be generated, which can be used to synchronize the time of other devices in a rack that can accept a PPS input, such as our range of network cards. This allows for extremely tight time synchronization between a large number of network cards for accurate hardware timestamping of network traffic. Both SFP+ ports are available as low latency network interfaces to the host. 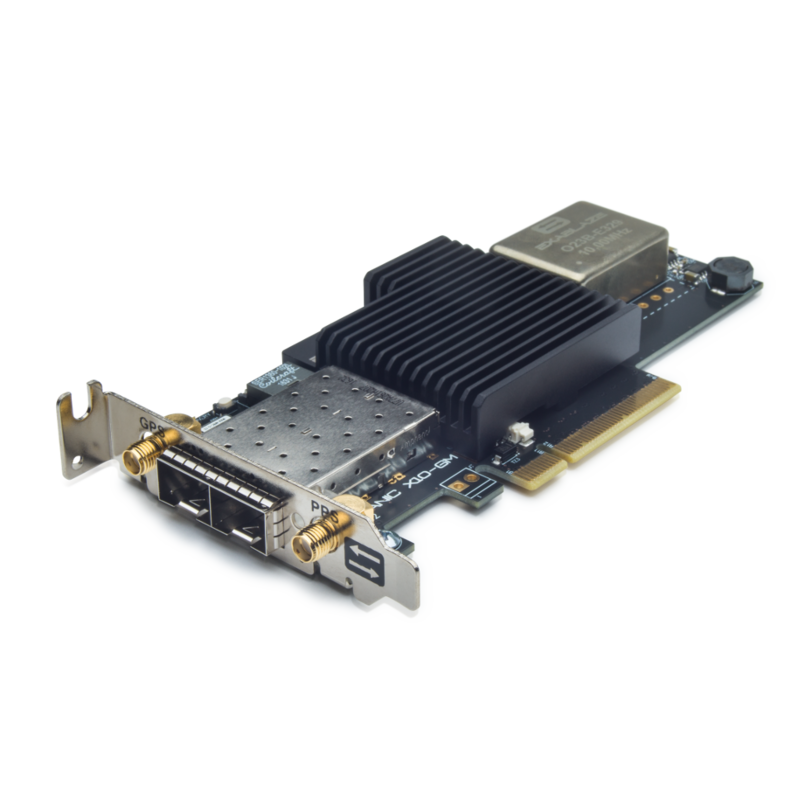 These interfaces have the same performance as our ExaNIC X10 - 780ns wire-app-wire for raw frames or 930ns for TCP payloads using our transparent kernel bypass library. Each port can be configured for 100M, 1G or 10G operation. *Sub microsecond TCP half round-trip time using the exasock transparent kernel acceleration library - see performance section. Test methodology available on request.